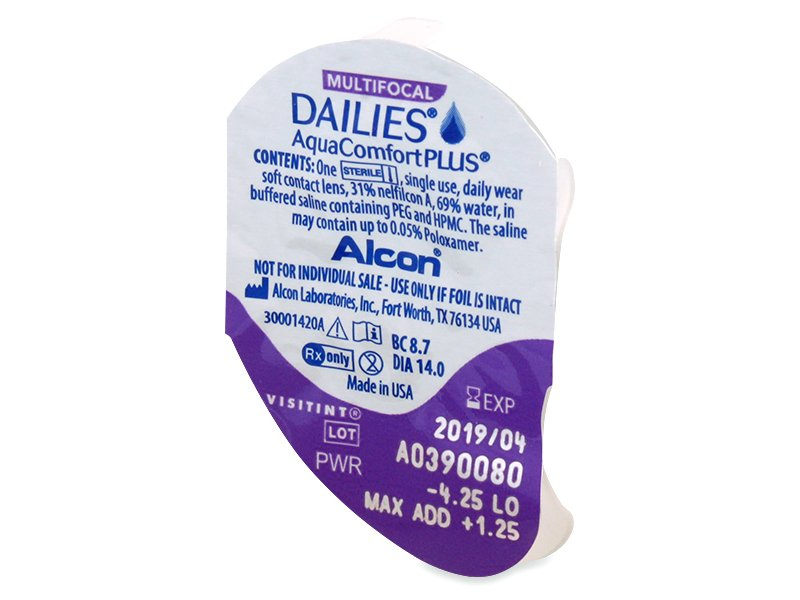 DAILIES AquaComfort Plus Multifocal are one-day multifocal contact lenses produced by Alcon, which are designed to correct presbyopia. Presbyopia is a common vision defect that affects many adults around the age of 40. This package contains 30 lenses. We also offer Dailies Aquacomfort Plus Multifocal in a package of 90 lenses. Been using multi-focal lenses for years and these are some of the best. 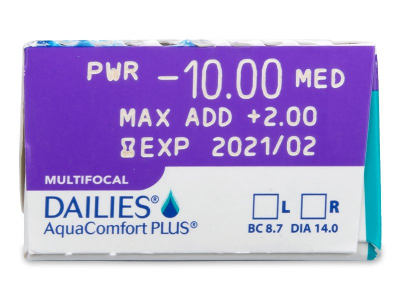 Hi, I am thinking of ordering these lenses however my prescription is BC 8.6 DIA 14.1. Would these not be suitable. Thank you. Tracey J.
Hi Tracy, thanks for your question. Dailies Aquacomfort Plus Multifocal BC and DIA are 8.7 mm and 14.0 mm, respectively. For most people, a difference of 0.2 mm or less will not cause any noticeable difference in comfort or vision quality. Double check with your optician if you have any concerns. 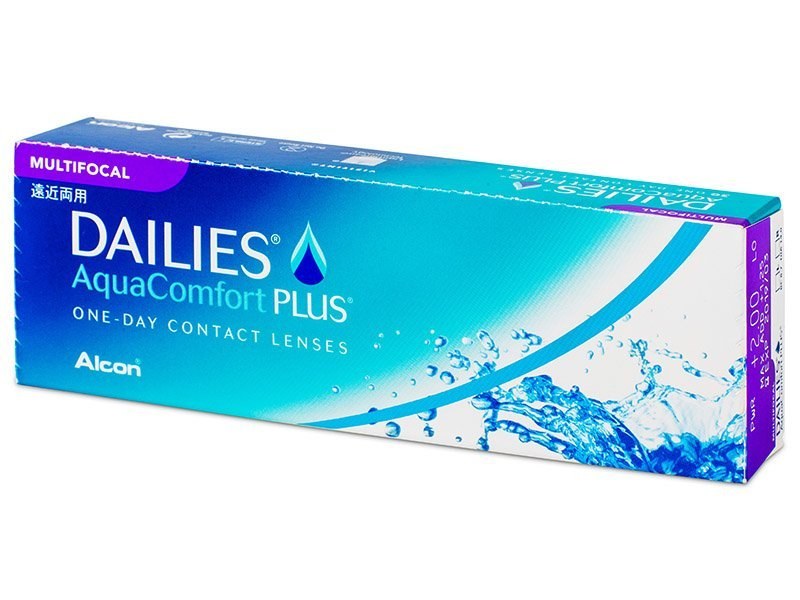 Hello- are the Dailies Aquacomfort plus hydrogel lenses? I've heard that's good. What is Nelfilcon? Hi Sam, yes, Dailies Aquacomfort plus are made from bio-compatible hydrogel material. They are designed to retain moisture and promote oxygen permeability for increased comfort and clarity. 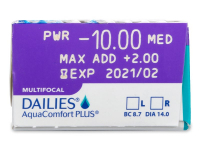 What are the Dailies aquacomfort plus multifocal add powers? Mine falls between low and medium, so how do I know which to choose? Hi Helen, with Dailies Aquacomfort Plus Multifocal lenses, it is recommended that you use the lower ADD power whenever possible, if your prescription falls between 2 levels. As a first-time lens user, I find these very comfortable, even when working on the computer for an extended time. Great service, and the lenses are wonderful. Much better than monthly lenses. Hi, Uta, Please contact our customer service at alensa.co.uk. Hi, Sally, The closest approximate counterpart would be max add +2.00, with a BC of 8.7 and a DIA of 14.0. My contact lenses are -1.25 left eye and -1.50 right eye. How I know which ones to order? Thank you for your recent comment. For advice on selecting lenses, please follow our lens parameters guide which you can find here: https://www.alensa.co.uk/…n-guide.html. If you need any further assistance in selecting lenses, please contact us on: 0203 514 5586 and we will be happy to help.